A strudel is a layered pastry with a sweet or savoury filling. 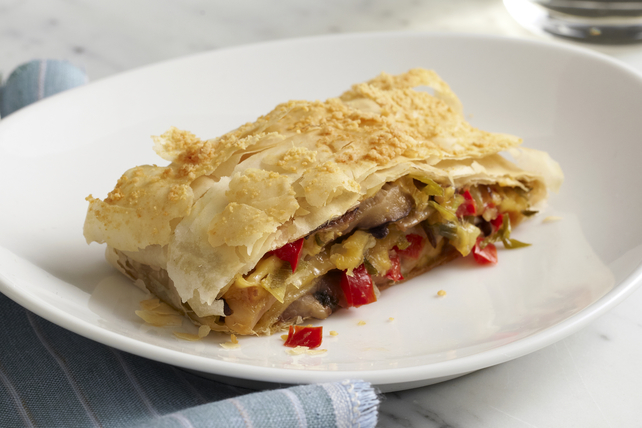 Our Cheesy Mushroom Strudel is made with a filling of sautéed vegetables and cheese, wrapped in a crisp phyllo pastry. With 12 servings, this savoury pastry makes a great party appetizer. Melt 2 Tbsp. butter in large skillet on medium-high heat. Add vegetables and garlic; cook 8 min. or until liquid evaporates, stirring occasionally. Stir in mozzarella, 1 Tbsp. Parmesan and cayenne pepper. Remove from heat. Stack phyllo sheets on clean kitchen towel; spread with mushroom mixture to within 1 inch from one short side of phyllo stack. Fold 1/2-inch-wide border over filling, then roll dough up, using towel to help roll strudel up. Place, seam-side down, on baking sheet sprayed with cooking spray. Melt remaining butter; brush over strudel. Sprinkle with remaining Parmesan. Bake 30 to 35 min. or until golden brown. Cool 5 min. before slicing. Add a dash of ground nutmeg to the cooked vegetables with the cheeses.